Senegalese leader Abdoulaye Wade has called on the richer nations to do more to help developing countries buy technology hardware. The president made his appeal at the UN World Summit on the Information Society (WSIS) in Tunis. The meeting is discussing ways of narrowing the technology gap between rich and poor. But money remains a contentious issue, with many richer nations cautious about providing more aid. 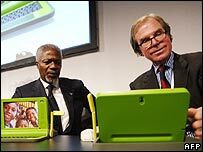 President Wade spearheaded efforts for a so-called Digital Solidarity Fund in 2003 at the first stage of WSIS in Geneva. He also proposed a 1% digital tax on all computers bought everywhere that would go towards efforts to get equipment into countries that needed it most. The fund was eventually set up and has been up and running for four months. But it is entirely voluntary and so far has only raised 7m euros (£4.7m). Only nine of its 22 members are countries and just one of these, France, is outside of Africa. "It is clear that the private sector cannot overcome all our problems," said President Wade. "We in Africa have taken the initiative to create the necessary infrastructure so that the private sector can come in, for example in telecoms," he told a news conference in Tunis. He said the fund was a "win-win" situation for everyone because businesses in the West would ultimately benefit from the millions that could then be spent on buying equipment from them. Even though more than 190 states have pledged support for the fund, which is managed by volunteers in Geneva, few had donated the $300,000 to join the fund. 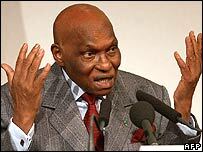 "True solidarity is amongst men, not states," said President Wade, reminding delegates that Africa was still desperately disconnected from the world. Every time new software was created, he said, the gap widened. But with the assistance of the fund as it stood, equipment was already being bought for schools and local communities. 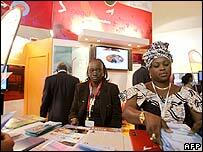 The Senegalese leader likened Africa's level of inclusion to being on a train. "It is better to be on the last coach of that train than not to be on it at all. Now we must move up the coaches," he said. He recognised however that training was just as important as hardware, for any progress to be sustainable. The thorny issue of net governance raised its head too, with President Wade expressing concern that the issue had not been fully resolved at the summit. Although he did not support the UN taking over governance of the net, he said: "We need to define a space that manages domains, but allows for democratic participation." He also called for a charter to protect human dignity and rights in the information society and touched on the need to prevent the "brain drain" from African nations. The Digital Solidarity Fund has already had some success in Africa. Broadband access is now in place at HIV/Aids clinics in Burkina Faso to give patients access to much-needed information, for example. President Wade reiterated that the appeal for more support was to developing nations too. He said Senegal and Nigeria had recently injected $500,000 into the piggy bank. Dakar was also working to set up a centre to whip up support for it. But there remains scepticism from some developed countries because it is a stand-alone initiative, separate from well-established organisations such as the World Bank. The issue of how to finance global efforts to close the technology gap between rich and poorer nations has been largely unaddressed at the summit, that ends on Friday.